It’s clear which camp has claimed me. I’m messy by nature, born with a high tolerance for stacks of teetering books on the floor, scraps of fabric and sequins piled in the corner, overstuffed bulletin boards with layers upon layers of postcards, photographs, ticket stubs. Not quite a hoarder, but hoard-ish—and the same goes for my drafts. I like the free expanse of a new story, the follow-your-nose excitement of letting an idea unspool on the page. I like letting the pages pile up, just like the dishes in the sink, until that same twang of disgust compels me into action: who made this mess? And why did they use so many damn spoons? But what about when you get there and you realize you’ve brought a crowd of people who barely know each other, have nothing good to talk about, and now you have to kick someone out, pull in someone else, and rearrange the significant details of their lives? Revision is a bear for me, in part, precisely because of my commitment to drafting in the dark. I don’t always know why I’ve picked these particular characters and placed them in this particular setting, and that makes it much harder to think through the process of who gets 86’d and who makes it to drafts two and three and beyond. 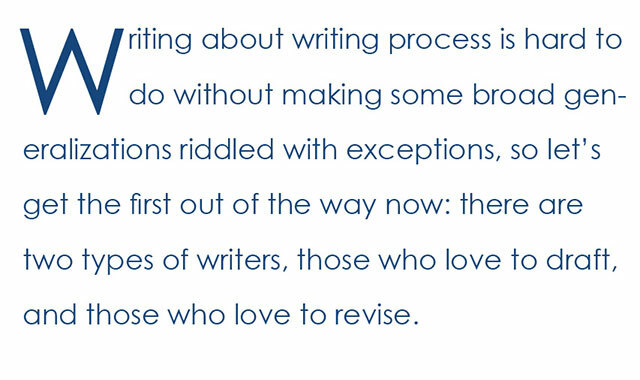 I started writing a novel last fall using my comfortable, messy, blunder ahead process. It had started as a collection of linked stories because that felt more doable, but I was already starting to play whack-a-mole with the various half-baked drafts I’d started amassing. A novel, I decided, would be a chance to “dive deeply into my real sensitivities to the world.” That’s Alice Elliot Dark, who was one of my teachers in the Rutgers-Newark MFA program. Alice believes that the deep work of storytelling starts with self-knowledge, with figuring out the fears and hopes and questions that obsess you. I was starting to realize that a single narrative could allow me to explore some ideas about disaster and survival, about the ways that people profit and persevere, or totally disengage, in the face of chaos and change. And so, in the fall of 2013, I started Writing A Novel. But it didn’t feel any different than the stories I’d already been working on before and during my MFA workshops. I hadn’t even decided where the book would take place, or who the main players would be, or why their lives would intersect. I had a few frustrating workshops that were nonetheless worthwhile in that they helped me realize how little I knew about the material I was starting to produce. After that semester, I took some time to reassess. I was a drafter, and this was drafting at its glorious messiest, so why didn’t it feel right? In part, I came to realize that the workshop format wasn’t suited to helping me think through the bones of a longer work. My peers offered candid responses and insightful questions, but I needed to be asking myself those questions first. I realized that I couldn’t possibly get far with this little figured out, then revise in the cursory way I’d done with my earlier short stories. Before starting the novel, I’d treated any revision of my stories like a snorkeler, not a scuba diver. I floated over the surface, looking for language errors and the “two faults” John Gardner articulates in The Art of Fiction: insufficient detail and abstraction. My revision process thus far was basic copyediting with a hefty serving of concrete detail shoehorned in. I wasn’t seeing my work in a different way, I was just rearranging the proverbial deck chairs (and describing the exact grain of their wood). I know that creating the kind of warm, fraught relationships that my teacher Tayari Jones pushed me to do in my final workshop won’t come from guessing along the way or adding a flourish of detail at the end. To become a better reviser, I realize I need to become a more thoughtful drafter. I still love the messy chaos of a first draft, but it’s starting to feel better to do it with at least a few solid structural supports in place. Who do these people love? What drives them to get up each morning? What do they fear will happen when their secret (what secret?!) is brought to light? It seems like an obvious and amateur oversight, but I think I was so stuck on surface revision for so long because it feels really satisfying to “fix” something. Editing a flawed sentence without considering the weight of the emotions being communicated is the craft equivalent of making it to a meeting on time even though I overslept. It’s satisfying, but it’s also a kind of a false victory. I need to set my alarm correctly every damn night. I need to do my dishes and not eat cereal with takeout chopsticks. I need to actually sink into deep thought about the kind of story I want to tell, the kind of relationships I want within that story, and the order of events I might try out that will reveal these relationships. This summer, I’m continuing to draft my novel while revising some of stories from these past two years. Post MFA, my revision process involves a lot more staring into space and thinking about love. This feels very different from frantically working with an eye on workshop deadlines, and some days it feels like I’m doing absolutely nothing. But I trust whatever this is, my new “process.” I trust that the network of veins will eventually reveal themselves, if first I get that messy heart warm and working, pumping with real feeling and love.